Information: Tom G. Bozigian, teacher of Armenian dance. Tom was born in Los Angeles, California, of Armenian parents. Tom's father immigrated from Gumri-Alexandropol (Leninakan), Armenian. Tom grew up in the Armenian community in Fresno, California, studying and experiencing Armenian language, music, and dance from both Caucasaian and Anatolian Armenians. Tom is particularly sought for his extensive knowledge of Armenian dances from the pre-1915 period. Following the massacres of the Armenian population in eastern Anatolia by the Ottoman Turks during the late 19th and early 20th centuries, many survivors found their way to the United States and the lush agricultural area of central California  the San Joaquin Valley  especially around Fresno. Through the activities of many Armenian pan-patriotic organizations, immigrants maintained the many songs and dances representing their many regions. 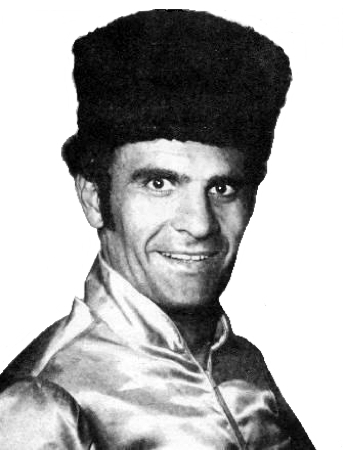 Tom frequented these affairs where he developed a life-long love of original Armenian song and dance. In addition to the dances of the pre-1915 period and the Caucasian Armenian dances, Tom specializes in the new Armenian folk dances and in choreography for stage presentation. A professional precussionist of music of the Caucasus, Near East, and the Balkans, Tom mastered the very complicated rhythmic meters of these regions in which he has many years of experience. Tom leads a folklore orchestra that has produced numerous recordings which are available from your local folk dance recording outlet or directly from Tom himself. He continues his classical dance training, studies musical arrangement and harmony, and directs a disk-jocky service called "Hye Bar Entertainment." Tom and his wife, Sheree King, also a dancer and choreographer, live in the Los Angeles, California, area, where now the largest concentration of Armenians reside outside of Armenia. GT-3001  Tom Bozigian Introduces Armenian Songs and Dances of the Armenian People. GT-4001  Tom Bozigian Introduces Armenian Songs and Dances of the Armenian People. Vol. 2. GT-5001  Tom Bozigian Introduces Armenian Songs and Dances of the Armenian People. Vol. 3.